After my last post about Mom’s fresh dill pickles, I became nostalgic for other foods that she used to cook. 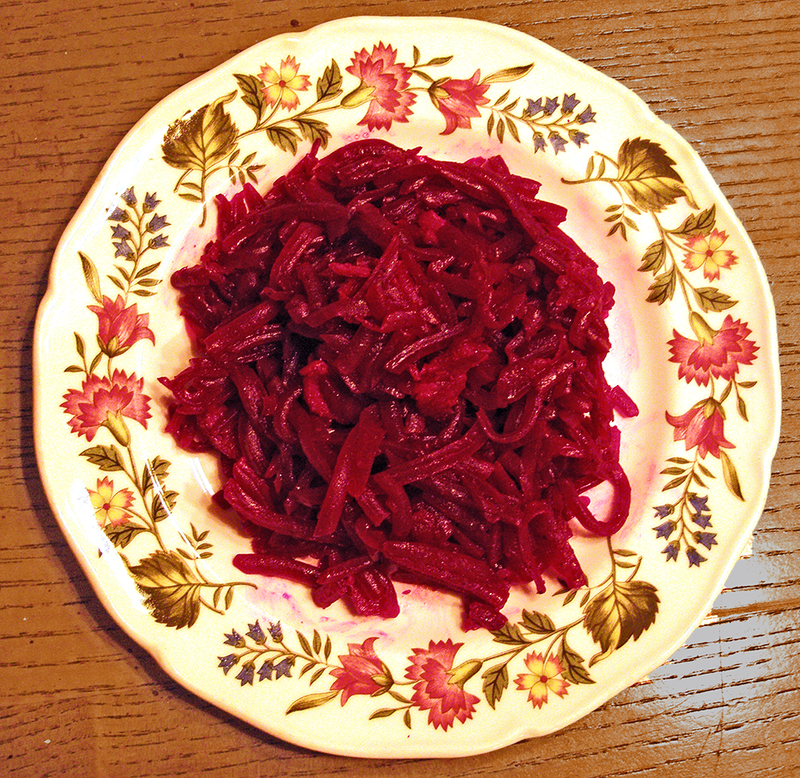 One of my earliest memories is of Mom cooking a Polish beet dish back in the early 1960s, and I’d wanted to recreate it for some time as part of exploring my Polish (cooking) roots. I’d hesitated because the first ingredient was salt pork—not very healthy, hard to find, and I have no idea how to cook with it. Our bounty of large old beets inspired me to experiment, using a little nitrite-free bacon in place of the salt pork. With surprisingly few ingredients, I came up with a recipe much like Mom’s. As always, feel free to adjust the recipe to your liking. Past experience grating beets by hand has resulted in red fingers. Grating by hand also takes a long time, and there is the need for considerable finesse. I’m a little afraid of food processors, but was surprised how easy it was to grate the hot beets this way. 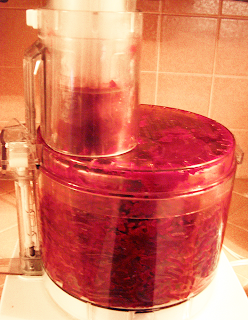 Since we had so many beets, it saved a lot of time. 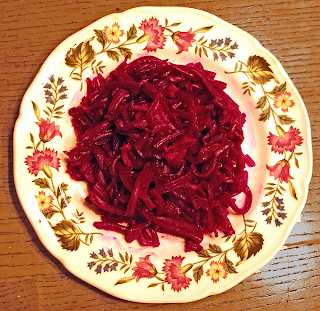 Peel or scrub beets and boil in water until tender enough to be easily pierced by fork, about 40 minutes for large Californian beets. Drain. When cool enough to handle, remove skins if you didn’t peel them. Grate by hand, or run through food processor with grater blade. Fry the bacon in a stainless steel skillet over medium-high heat until cooked but still flexible. Turn off heat, remove bacon from pan, drain and blot on paper towels, and chop or tear up into small pieces. You should have about 2 tsp. – 1 tbsp. bacon fat left in the pan. Reheat bacon drippings and add grated beets (about 2 ½ cups), fold in till hot and evenly coated with oil. Add bacon pieces and vinegar, and stir till evenly distributed. Serve hot.